Hypnocoustics is the solo psychedelic trance project of London based artist Joe Studt. Originally formed in 2009 with Benjamin Wood, Joe has since solidified his reputation within the UK as one of the countries top psychedelic producers with a string of hit EP’s, two albums on Liquid Records and many rocking live performances to some of the biggest and best dance floors on the global scene including bookings at Glastonbury, Boom Festival, O.Z.O.R.A, Universo Paralello and Noisily Festival in the UK. I have been profesionaly djing and promoting nights since the beginning of november 2006, starting with a small nightclub in southend-on-sea. Since then i have been lucky enough to play at many events across the UK. Some of these include; The Ministry of Sound (Halcyon), The Factory and Club Colosseum in London. The Ritz Sound Control and Stain's Hollow (illuminaughty) in Manchester, The Plug (plannet zogg) in Sheffield. The Marcus Garvey (Ascension) in Nottingham. The West Indian Centre (Sunrise) & many at The Beaverworks in Leeds. I have also been lucky enough to play at many festivals in the uk over the years. Some that I have played at include; Alchemy Fest (Dance stage), Magikana (Alternative + Main stage), Small Trees (main stage), Bearded Theory (dance stage), Beat Herder psytrance stage) & many more . I am a resident dj and organiser for a eclectic electronic dance music night in Leeds, called REMEDY [facebook.com], [facebook.com]... I am also lucky enough to be one of the organisers for Psychadelic Breakfast, a small group of "party putter oners" and like minded people, who put on parties, and run a tent at various festivals across the UK. I have also done lots of internet radio across the years, starting with happynation.co.uk, jedi-radio.com and spiceradio.co.uk. I now do regular live streams on [chew.tv] every Thursday and Friday nights, and recently became part of a few groups who also stream regularly. I Mix most styles of dance music from chill out + reggae grooves, through to funky house, breaks, electro swing and progressive beets. All the way up to full on psytrance and hard dance and drum & bass... Psytrance will always be my favourite genre to mix, but I love trying out new genres and styles. Ozzy Cetin aka Mysticism, Ramizes & Freetech was born in 1984 in Istanbul and discovered psy-trance at the age of 18 through the artists Kox Box, Cosmosis, Hallucinogen, Goa Gil, Astral Projection etc. Since then he has been gathering a psy-trance archive, which still continues. Whilst studying towards a BA, Ozzy organized various indoor parties and performed under the alias ‘Ramizes’ between 2004 – 2007. Meanwhile, he helped out his producer friends by giving them ideas and loops for their new tracks. Since 2006 Ozzy has been involved in some of the most well respected international festivals such as Ozora (Hungary), Psy-Fi (Holland), Sonica (Italy), Earthcore (Australia), Free Earth (Greece), IllumiNaughty (UK). Within Turkey he performed at, and worked with many festival organizations including Tree of Life, Mind Manifest Project, Neon, Ayata, Freaks in Love and Soulclipse Festivals. He now dedicates himself to his Istanbul & Manchester based psy-trance events organizer community; CRYSTAL KIDS; to spread to word through the minds & souls which are ready to UNITE with RESPECT, PEACE & LOVE. As a freelancer, Ozzy is also doing artist liaison and music management at Ayata Festival (Turkey); production management at Free Earth Festival (Greece); general coordination at Psy-Boutique Festival (Turkey); ambassadorship of Shankra (Switzerland) & Tree of Life (Greece) Festivals to the UK. Along with outdoor festivals, Ozzy performed over 150 gigs including indoor events since 2004 around the globe. 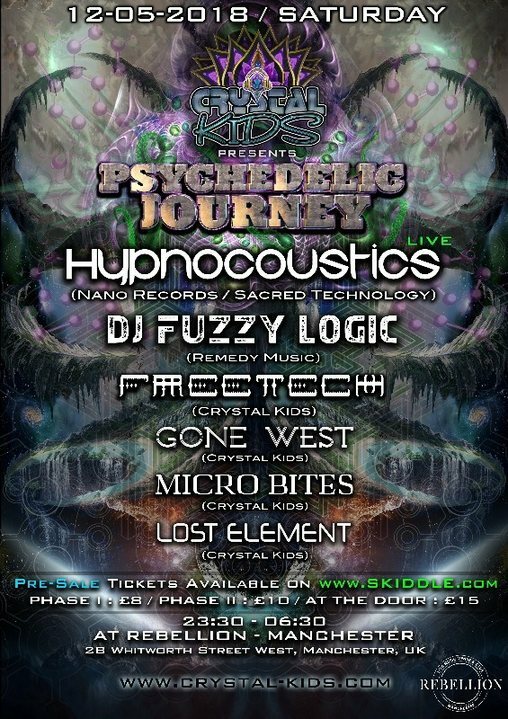 Ozzy, as a resident DJ at Crystal Kids mixes; Psychill, Psybient, Chillgressive as MYSTICISM; Progressive, Dark Progressive, Fullon, Psytrance as RAMIZES and Twilight, Forest, Hitech styles as FREETECH. Micro Bites is the name of the Deep Melodic Techno project from Juri Ceresato, who has started in the earliest 2010 when Juri decided to make psy-trance music. Music has always played a big part of his life, as from a young age he performed as a guitarist in metal bands, until he found a big interest and passionate attraction to electronic dance music. DJ and Producer since 2008, with a passion for psy-prog, morning and full on styles of psychedelic trance. Resident for Crystal Kids, and a regular at Sunrise, Tribal Sphere and Remedy. Influenced by a wide variety of artists, labels, club nights and festivals GoneWest searches for deep, melodic, psychedelic and progressive sounds and tailors his genre-defiant sets to take the listener on an avant-garde sensatory journey. in 0.332 seconds server time.